The other day I was having a nice discussion with a very knowledgable colleague about advances in genomic sequencing and how they are poised to transform the way we acquire and process genetic information in biology, biochemistry and medicine. The specific topic under consideration was the bevy of sequencing companies who are showcasing their wares at the Advances in Genome Biology and Technology 2015 conference. Many companies like Solexa and Oxford Nanopore are in an intense race to prove whose sequencing technology can become the next Illumina, and it's clear that much fame and fortune lies ahead for whoever gets there first. It's undoubtedly true that technological developments in this field are going to have enormous and uncertain ramifications for all kinds of disciplines as well as potentially for our way of life. And yet as I mull over these issues I am reminded of an article by MIT biologist Michael Yaffe from the journal Science Signaling which warns against the quick wielding of what the philosopher of technology Yevgeny Morozov has called “technological solutionism”. Technological solutionism is the tendency to define problems primarily or purely based on whether or not a certain technology can address them. This is a concerning trend since it foreshadows a future where problems are no longer prioritized by their social or political importance but instead by how easily they would succumb under the blade of well-defined and easily available technological solutions. Morozov’s solutionism is a more sophisticated version of the adage about everything looking like a nail when you have a hammer. But it’s all too real in this age of accelerated technological development, when technology advances much faster than we can catch up with its implications. It’s a problem that only threatens to grow. In his piece Yaffe alerts us to the pitfalls of somewhat mindlessly applying genomic sequencing to discovering the basis and cure for cancer and succumbing to such solutionism in the process. One of the great medical breakthroughs of the twentieth century was the finding that cancer is in its heart and soul a genetic disease. This finding was greatly bolstered by the discovery of specific genes (oncogenes and tumor suppressor genes) which when mutated greatly increase the probability and progress of the disease. The availability of cheap sequencing techniques in the latter half of the century gave scientists and doctors what seemed to be a revolutionary tool for getting to the root of the genetic basis of cancer. Starting with the great success of the human genome project, it became increasingly easier to sequence entire genomes of cancer patients to discover the mutations that cause the disease. Scientists have been hopeful since then that sequencing cancer cells from hundreds of patients would enable them to discover new mutations which in turn would point to new potential therapies. But as Yaffe points out, this approach has often ended up relegating true insights into cancer to the application of one specific technology – that of genomics – to probe the complexities of the diseases. And as he says, this is exactly like the drunk looking under the lamppost, not because that’s where his keys really are but that’s where the light is. In this case the real basis for cancer therapy constitutes the keys, sequencing is the light. During the last few years there have been several significant studies on major cancers like breast, colorectal and ovarian cancer which have sought to sequence cancer cells from hundreds of patients. This information has been incorporated into The Cancer Genome Atlas, an ambitious effort to chart and catalog all the significant mutations that every important cancer can possibly accrue. But these efforts have largely ended up finding more of the same. The Cancer Genome Atlas is a very significant repository, but it may end up accumulating data that’s irrelevant for actually understanding or curing cancer. Yaffe acknowledges this fact and expresses thoughtful concerns about the further expenditure of funds and effort on massive cancer genome sequencing at the expense of other potentially valuable projects. So far, the results have been pretty disappointing. Various studies on common human tumors, many under the auspices of The Cancer Genome Atlas (TCGA), have demonstrated that essentially all, or nearly all, of the mutated genes and key pathways that are altered in cancer were already known…Despite the U.S. National Institutes of Health (NIH) spending over a quarter of a billion dollars (and all of the R01 grants that are consequently not funded to pay for this) and the massive data collection efforts, so far we have learned little regarding cancer treatment that we did not already know. Now, NIH plans to spend millions of dollars to massively sequence huge numbers of mouse tumors! I believe the answer is quite simple: We biomedical scientists are addicted to data, like alcoholics are addicted to cheap booze. As in the old joke about the drunk looking under the lamppost for his lost wallet, biomedical scientists tend to look under the sequencing lamppost where the “light is brightest”—that is, where the most data can be obtained as quickly as possible. Like data junkies, we continue to look to genome sequencing when the really clinically useful information may lie someplace else. The term “data junkie” conjures up images of the quintessential chronically starved, slightly bug-eyed nerd hungry for data who does not quite realize the implications or the wisdom of simply churning information out from his fancy sequencing machines and computer algorithms. The analogy would have more than a shred of truth to it since it speaks to something all of us are in danger of becoming; data enthusiasts who generate information simply because they can. This would be technological solutionism writ large; turn every cancer research and therapeutics problem into a sequencing problem because that’s what we can do cheaply and easily. 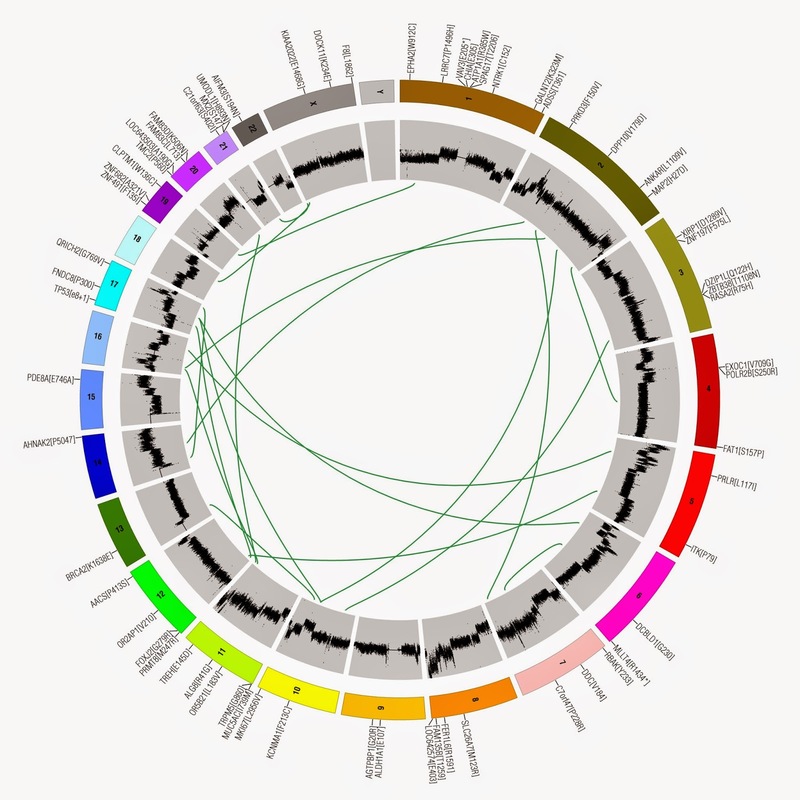 These therapeutic successes may have come even faster, and the drugs may be more effectively used in the future, if cancer research focuses on network-wide signaling analysis in human tumors (20), particularly when coupled with insights that the TCGA sequencing data now provide Currently, signaling measurements are hard, not particularly suited for high-throughput methods, and not yet optimized for use in clinical samples. Why not invest in developing and using technologies for these signaling directed studies? In other words, why not ask the drunk to buy a lamp and install it in another part of town where his keys are more likely to located? It’s a cogent recommendation. But it’s important not to lose sight of the larger implications of Yaffe’s appeal to explore alternative paradigms for finding effective cures for cancers. In one sense he is directly speaking to the love affair with data and new technology that seems to be increasingly infecting the minds and hearts of the new generation. Whether it’s cancer researchers hoping that sequencing will lead to breakthroughs or political commentators hoping that Twitter and Facebook will help bring democracy in the Arab world, we are all in danger of being sucked into the torrent of technological solutionism. Of this we must be eternally vigilant. I agree with most of what is written. But I cannot help noticing the irony of the post. It denounces vehemently the data-junkie looking under the light of sequencing But at the same time it praises a scientist studying signaling for suggesting that signaling could be a key of cancer therapeutic (it may well be I agree) and asking for more funding to build its own "light" under" which to research. True, although I think it's also about the kind of data. In some sense everyone is a data junkie, but if you are dealing with data with more meaning (such as interaction data about signaling networks) rather than just raw sequences I would think it's more useful. I somewhat agree on the point of technological solutionism. It leads to science not thinking much anymore. Just hit the button and something will come out. No matter how useful, you will likely be able to publish it somehow. So that strategy, on an individual basis concerning the individual scientist, also has to do with the good old "publish or perish". I do prefer good thinking and good hypothesis first, then you look for the best experimental system to support or falsify your hypothesis. Ideally, if there is no good expremimental technology to do so, you develop a new one. But again, that's the hard way, and few are able to go that way. On the other hand, not looking under the lamp post simply because it is too simple and straightforeward is also not really a solution, is it? After all, the data TCGA collects is not lost even if at first sight it doesn't open any new doors. When more signaling network/proteomics information becomes available, one will be able to combine that with the sequence data. And that's really what Yaffe proposed in 2013, see Fig.1 "Combining genomic, proteomic, and signaling data...."
One of such is sarcoma a type of cancer that develops from certain tissues, like bone or muscle. Bone and soft tissue sarcomas are the main types of sarcoma. Soft tissue sarcomas can develop from soft tissues like fat, muscle, nerves, fibrous tissues, blood vessels, or deep skin tissues. The Soft Tissue Cancer Symptoms are the first sign of a sarcoma in an arm, leg, or torso may be a painless lump or swelling. Most lumps are not sarcoma. The most common soft-tissue lumps are lipomas, which are made of fat cells and are not cancer.